Posted on July 24, 2014 by Mike Sonnenberg Posted in Bars and Restaurants, Michigan Historical Markers	. 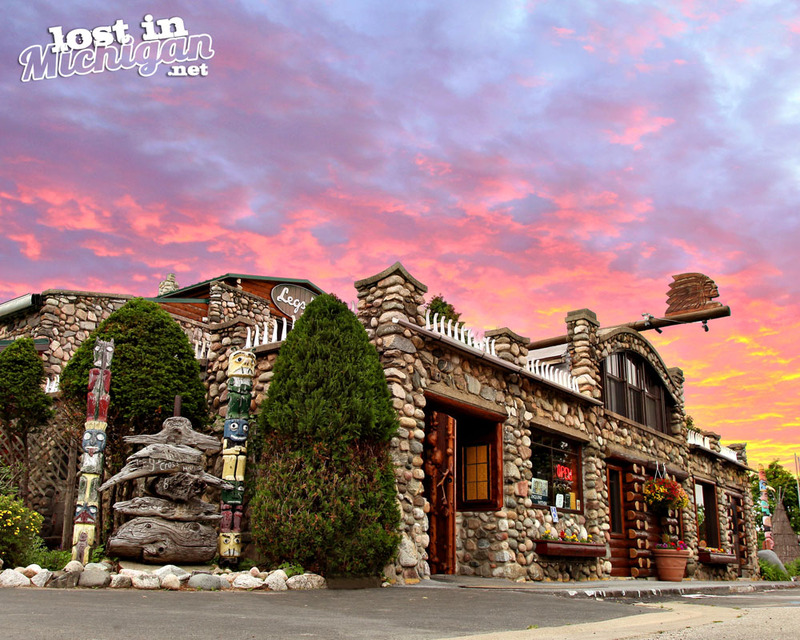 The Legs Inn, in the town of Cross Village, named for the stove legs that trim the roofline, is one of Michigan’s most exuberant and unusual landmarks. The building reflects Stanley Smolak’s creativity and the craftsmanship of local Odawa (Ottawa) Indians. A Polish immigrant, Smolak came to the United States in 1912 and settled in Cross Village in 1921. During the 1930s Smolak enlisted the labor of Odawa and other area residents to construct the inn from locally gathered timber and stones. A self-trained artist, Smolak used tree roots, limbs and driftwood to carve fantastical creatures into furniture and decorative objects used in the inn. He called his carvings “natures oddities.” Until his death in 1968 at age eighty-one, Smolak continued his creative work at the inn, which had become a social center for the community. Tags: cross villige, emmet, emmet county, Historical Marker, legs inn, michigan	.